y late March 1945, the pathway to invasion of the southernmost major island of the Japanese archipelago, Kyushu, had been secured but for one necessary stepping stone American forces required to support their tactical air effort leading up to and overhead the projected invasion of Japan, set to begin in the autumn of 1945. The seizure of Okinawa and its airfields was vital to the land-based strategic bombing campaign that would precede and support the invasion of Japan and for close-in basing of the scores of Marine and U. S. Army Air Forces tactical air units that were slated to guard the approach of the Kyushu invasion fleet and operate over the beachheads and inland battlefields in the face of anticipated fanatical Japanese air defenses. Marines of the veteran 1st and 6th Marine divisions and tens of thousands of battle-tested soldiers of the U.S. Army’s XXIV Corps assigned to seize Okinawa beginning on April 1, 1945, saw nothing but weeks or even months of heavy fighting ahead as they sailed to confront the largest Japanese defense force deployed on any island Americans invaded in the Pacific. 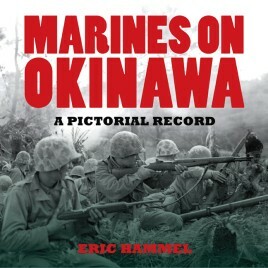 Telling the tale of the brutal Okinawa campaign in crisp, to-the-point prose illuminated by 467 gripping photographs taken by U.S. Marine Corps combat photographers, veteran military historian Eric Hammel provides an engrossing pictorial account of the final Marine Corps island conquest of World War II.